At L & S Service we keep in stock popular automotive and light truck drive shaft components, including slip yokes, weld yokes, center support bearing assemblies, double cardan components, and drive shaft attaching parts. In fact, we have many parts that one would have trouble finding anywhere in the area. We try to have the area's most complete inventory and knowledge of automotive driveline 'change-over' universal joint kits. 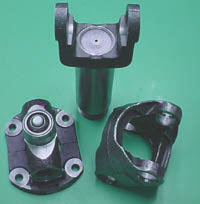 These kits allow one to adapt driveline components to applications that are other than originally manufactured. We also offer carry-in repair on driveshafts, including some custom cut-and-weld operations.